P.I. Roofing and Home Solutions, “Your Roof Leak Detective”, was founded by Joel and Veronica Johnson in January of 2001. We started the company in an effort to serve others by fixing and maintaining their roofs. In 2003, we started installing commercial roof systems. In 2008, we installed two one million dollar commercial roof systems. In 2011, we joined Gutter Helmet® so our customers will never have to clean their gutters again! No roof is complete without its rain gutter system in terms of aesthetics, but more importantly protection. 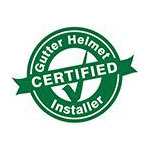 Using Gutter Helmet’s patented design protects your home from water damage and extends the life of the system. By keeping out leaves, twigs, pine needles and other debris, rainwater will flow freely to the downspout and away from the house. With Gutter Helmet, there are no more climbing ladders and risking serious injury, or paying someone to clean your gutters ever again! Trust is difficult to obtain, and easy to lose. From our first repair in 2001 to our current projects, we make it our goal to maintain the highest standards. We hold ourselves not only accountable to our customers but ultimately to God. At P.I. Roofing and Home Solutions, you receive honest answers about your roof and gutter system needs. We provide a written analysis with projected solutions so you know exactly what we recommend and what we estimate the cost to be. We provide the highest quality products and stay in tune with the latest materials and technologies, but there is a more important characteristic that sets us apart…Our team of dedicated employees. From our owners, project managers to field and office personnel, our sole purpose is to stand behind our commitment to quality. Our team understands the value of your investment and we work hard to not only meet, but also exceed, your expectations. Service means serving our customers when it is convenient for them. Service is more than fixing a leak; it is finding the problem and solving it completely. We want to build long-term relationships with our customers. With this in mind, our warranty and service is unmatched in our industry. At P.I. Roofing and Home Solutions, we take pride in our service and treat each property as if it were our own extending our commitment well after the job is completed. It is our sincere hope that our customers are completely satisfied with our service and will tell their friends and family about us. Contact us today at (866) 882-5677 or fill out the online form here to learn more about our services. We look forward to serving you!